Do you remember 2012? When referendums were new and exciting and they came to us and asked us “Do you want a mayor?”, and we rose with one voice and said “No, we don’t want a mayor.” Well, the will of the people doesn’t mean quite the same thing when it doesn’t threaten to cause a rift in the Conservative party. OK, it’s not quite the same job we turned down, this new mayor won’t have the budget that a Birmingham mayor would have, they won’t have anywhere near the powers that a Birmingham mayor would have had and will cover a geographic area that I defy anyone to try and draw. Any hustings is only as good as the person chairing and whether they can resist giving their own answers to each question. This year we got Karen Osborne from Brandwood Forum. Each candidate gave a quick introduction followed by four questions for all candidates, and then some random local questions thrown in. I’m not going through all of it. It was a long long meeting where all of the candidates agreed on just about everything. Graham Stevenson (Communist Party) – Graham doesn’t want to be mayor, he doesn’t think there should even be a mayor, good man. He likes big meetings, he doesn’t like neo-liberal economics and believes all the money is hidden in the Cayman Islands. Always good to end on a fact. Sion Simon (Labour Party) – Sion can’t use a microphone very well. After a few false starts we got locked into a bit of debate on whether he was going to get any of his time back because the microphone was complicated. He’s tremendously proud of us, which is nice. He is proud of the things we have done, like invent steam engines that changed people’s faces. He left that cryptically hanging in front of us. Sion was the first to promise to reopen the Moseley rail line (he won’t), managed to get two TAKE BACK CONTROLS in the last thirty seconds and promised us all a pie. Pete Durrell (UKIP) – Pete’s a mumbler, most of his introduction is lost to history. He did give a detailed explanation of how the voting system works. You’re all adults, you can look it up yourself. Beverley Neilson (Lib Dems) – Beverley is very good with a microphone, very clear. She has had lots of jobs. She has launched a social enterprise. Since the launch of this campaign her Facebook page has had 300% more likes. She didn’t provide a baseline number of likes to draw any conclusions on how good that is. James Burn (Green) – James wants change. He doesn’t believe politicians are listening to people and he wants politicians to be closer to people. He didn’t explain how creating more regional politicians solves either problem. He will also get rid of child poverty in one year. We can all get behind that. Andy Street (Conservative) – He’s a loud man. He thanked us for coming, which was polite. He told us this is a once in a lifetime opportunity. Which is a little worrying as this has been widely billed as a three-year term, is he planning to rule us forever? We all know he stood down from John Lewis, the obvious question we all wanted answered is “Why would you do that?” He didn’t tell us. He has utter tenacity, oodles of energy and is great at team building. If this doesn’t work out you will be able to book him for corporate away days. Andy conspicuously avoided mentioning the Conservatives in his opening statement. It was 87 minutes into the whole evening before he mentioned them at all. The lengths he is going to in order to avoid being associated with his own party are stunning. Then there were questions. I’ll keep this short. Question 1 – What would you do about the A435? Yes, really, as vague as that. Andy told us he will reopen the train line (he won’t) he’ll make cycling great again and will tax polluting vehicles. James said he will reopen the train line (he won’t) and will nationalise the railways. At this point it became obvious that in the absence of any real power they were all going to promise us anything and everything. Beverley is going to…… yep, open the rail line (she won’t). Peter is, obviously going to open the train line (he won’t), he thinks it’s very unfair that people are having a go at diesel cars and would like to make people live in office blocks in the City Centre. Sion will open the station (he won’t), get rid of pollution and nationalise the M6 toll. Sion gets the award for the first actual policy of the night. This question seemed to trigger Graham in some way. He started answering loudly and reached a deafening crescendo at the end, it was like the end of days, but transport related. He will make sure we own all the transport companies and get “old bangers” off the roads. Keen hustings observers will be pleased to know that this came from the same person who last year asked local prospective councillors “What are you going to do about the 50 bus stop outside the Co-op?”. I imagine this is some form of performance art where, through the years, each stop is questioned in turn. Only Sion answered this and said that he wants to start asking people with disabilities where they want bus stops and then listen to them. That does seem the appropriate thing to do having gone to the trouble of asking them. No solutions to the problems with the 50 bus were proposed. Question 2 – Affordable housing, what are you going to do about it? James told us the market had failed and there isn’t a great deal the mayor will be able to do about it. Beverley told us that the mayor needs to be able to borrow money, but won’t be able to. Andy will build 25,000 houses a year and will give brown field sites to the private sector. Sion wants to make a regional spatial plan. Graham doesn’t want to make a regional spatial plan but does want the council to provide mortgages. Peter doesn’t agree with borrowing and believes the Government should give all of us more money. Overall this wasn’t the greatest indictment of the powers of a new mayor. Things perked up a bit at this point. Instead of a question, each candidate was asked to write down what they thought an affordable rent and affordable house should cost. We need more games at these things. This was a partial success as everyone wrote down largely the same thing (about £200 per month rent and £100,000 for a house). Which is nice but doesn’t really exist. Oh, everyone except Sion, he doesn’t play by the rules, he wrote down the national definition of an affordable rent. Which wasn’t the game. Question 3 – How much will you spend on staff and how many staff will you have? Noting that the mayoral budget is £36.5 million. Peter admitted that the budget probably won’t cover costs. Andy anticipated employing 5, 6 or 7 staff and will make sure that the job pays for itself over 100 times. James made probably the most important point of the night. All the money, going to the mayor, is conditional on meeting growth targets. These are raw growth targets and don’t take account of how money is used or how it is spent in an area or if profits are going abroad. Beverley will launch an innovation fund. At this point all candidates started just answering questions they hoped they’d been asked. Sion doesn’t know how much it will all cost but will publish a report at the end of three years. Graham thinks the mayor should be compelled to go to meetings, hopefully the rest of us won’t also be compelled to go to these meetings as well. Two local questions stood out. One to Andy, “How can you promote prosperity when Government cuts undermine the West Midlands?” His answer wasn’t up to much, a stream of consciousness about a successful economy, global firms and autonomous cars; but it did get the best (only) heckle of the night “You’re sacking teachers”. Andy looked proper annoyed about this, but if you’re going to stand for a party then you must own all the things they do. The other question started off pointing out the strong support for remaining in the EU in this area but pivoted at the last minute into asking what the future for young people would be in the next two years. There was a visible look of relief on Sion’s face as he realised he could dodge explaining the Labour EU policy. Andy told us the people have spoken so we must listen. That went down well. He told us that he is explaining the importance of no tariffs for the West Midlands to the Prime Minister, that’s also clearly going well. Beverley sees the future in autonomous cars (what is the fascination with autonomous cars? They got loads of mentions). Peter explained to us how in negotiations with the EU we hold all the aces, instantly disqualifying himself from any position of authority. This was met with absolute silence. Then it was time for each candidate to tell us the key changes they would make in 3 years’ time. Graham would have put all transport into public hands (remember, this is Graham who didn’t want the job two hours ago). He would implement transport franchising, after all, he almost invented franchising in London, we will never know what almost means in this context. He will negotiate with the Chinese to let us build trains in the West Midlands. I don’t know how or why the Chinese are stopping us building trains. Sion will make sure that he is also running schools and all health and social care within three years. You get the feeling Sion is applying for a completely different job in the hope he gets promoted. Peter wants to continue mumbling, he doesn’t want to be secretive and wants massive investment. Beverley is going to develop a self-made place (I’ve no idea what this means), give free transport to 16-25 year olds, give all of us free travel on Saturdays so we can visit the rest of the region, free bikes for everyone and a community hub in every community. We’re not getting much change from our £36.5 million with Beverley. James wants to appoint a deputy mayor and create an elected assembly for the region. Andy says three years sounds like a long time but it is also a short time. He wants to create 100,000 jobs, which is a big number. He wants to win the City of Culture award, he didn’t specify for which City or how we would do that having left the EU. Unless he means the local city of culture award we invented to make small towns feel better about themselves. He also wants to get back to the number of homeless people we used to “enjoy”. I’ll leave that there for you to think about. 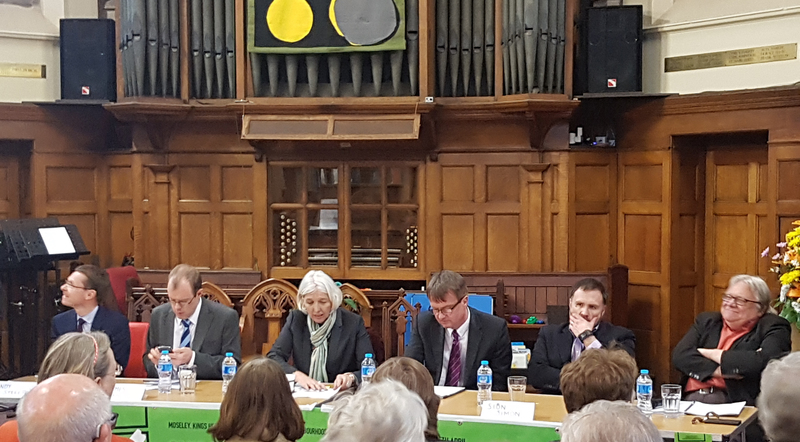 There you go, the Mayoral hustings. If I had to pick a winner then it would probably be James Burn. He had the most confident answers and was tall enough that we could see him when he stood up. Let’s all meet up again for the national election hustings in a few weeks. Thank you, I had been intending to go to this but other things got in the way – excellent coverage! This is bang on. I was there but lost a hearing aid battery (and the will to live) at about half eight so may have missed some of the crescendo of pledgemaking. Did anyone promise to broker peace in Syria? Incidentally the report is accurate on the demographic profile on the night. I could have borrowed a hearing aid battery from half the audience. wonderful. Please report on the general election in the same manner! Thanks, I always do the General Election hustings, unless they’re on a Thursday. They don’t tend to be on a Thursday. Shock! Horror! The candidates pledged to re-open Kings Heath train station. What will happen to Hickory Dickorys?